Dedman, Stephen. GURPS Dinosaurs, Steve Jackson Games. Rules updates on Ice Age characters; some bestiary references. Walking with the Prehistoric Beasts. Produced by the BBC. Behaviour and attitudes of prehistoric man; prehistoric animals. Walking with the Cavemen. Produced by the BBC. Behaviour and attitudes of prehistoric man. Wilson Tate, Kirk. 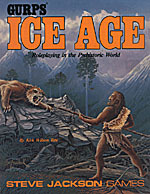 GURPS Ice Age, Steve Jackson Games. General background; events derived from Wolf Pack on Bear River adventure.